Pretty Babs took the side stage for the second time in two days – mercifully this time there were no electrocutions for Sam. 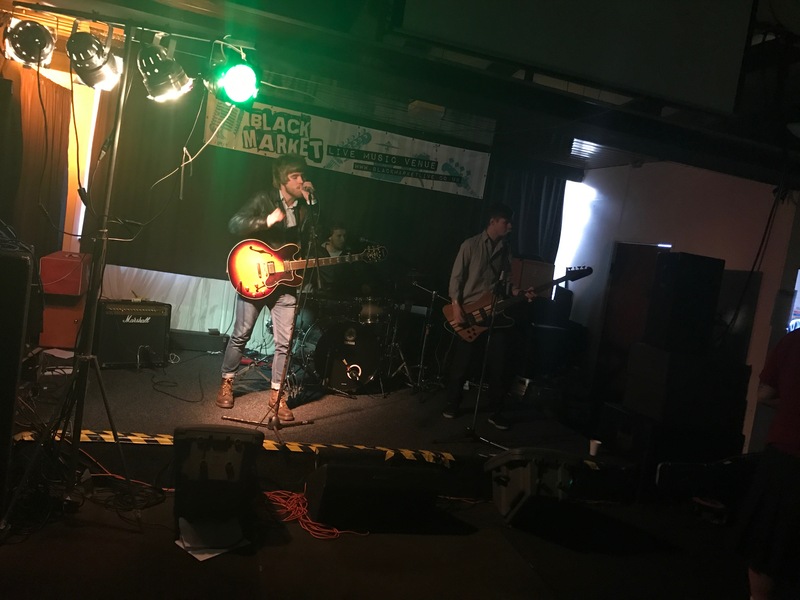 The sound was much better too – a heavy fulsome rock considering there’s just the three of ’em, Sam got things underway with some indulgent feedback from his guitar and they were underway. 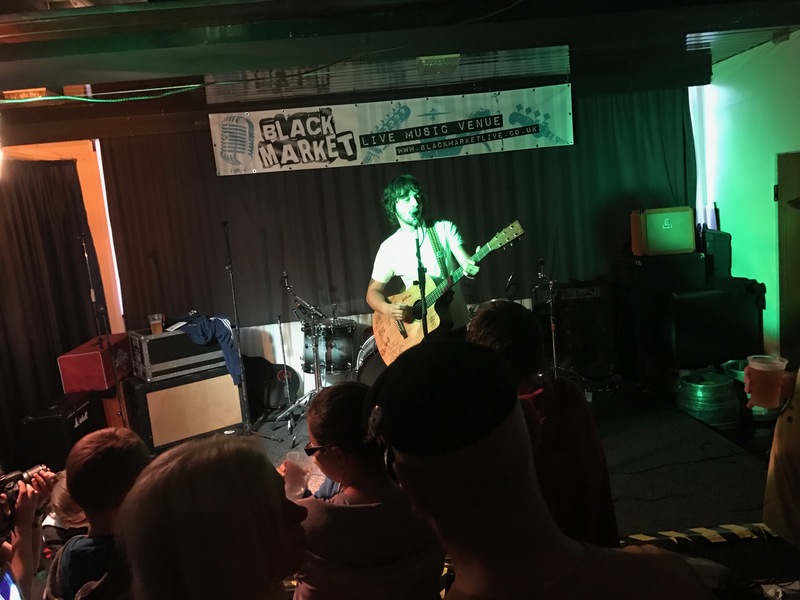 As with the night before, heaven knows what the song titles were beyond Buttons and Pennies and Michaela – I’m hoping that they become a regular feature on my gigging circuit though. A brief sojourn outside was worth it just to see the steady stream of folk with bags full of food and toiletries for Framework. The volunteers were happily loading it into a car outside – meanwhile with Mark arriving we started shifting our CDs in earnest – including passing one on to the Framework guys since it was them we were raising money for (it’s not too late to donate!). Over the course of the day we got a bit carried away handing them out and probably need to get some more done for folk who weren’t present. Oops! 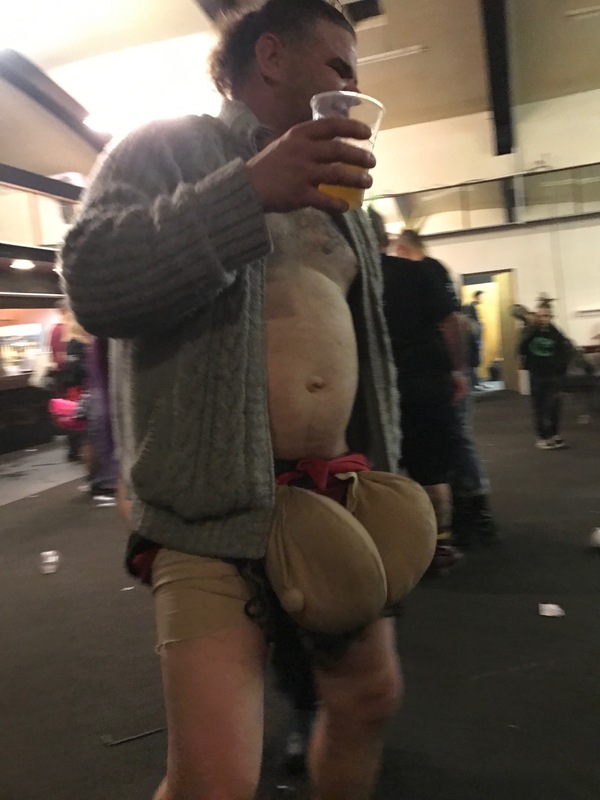 I was drawn back in by the powerful sound of One Eyed God, though – a full on folk, ska, punk, hip hop, reggae hybrid – intense, probably too energetic for the time of day (not a criticism, I just reckon it would be enhanced with a few more beers down the hatch and a good dance). 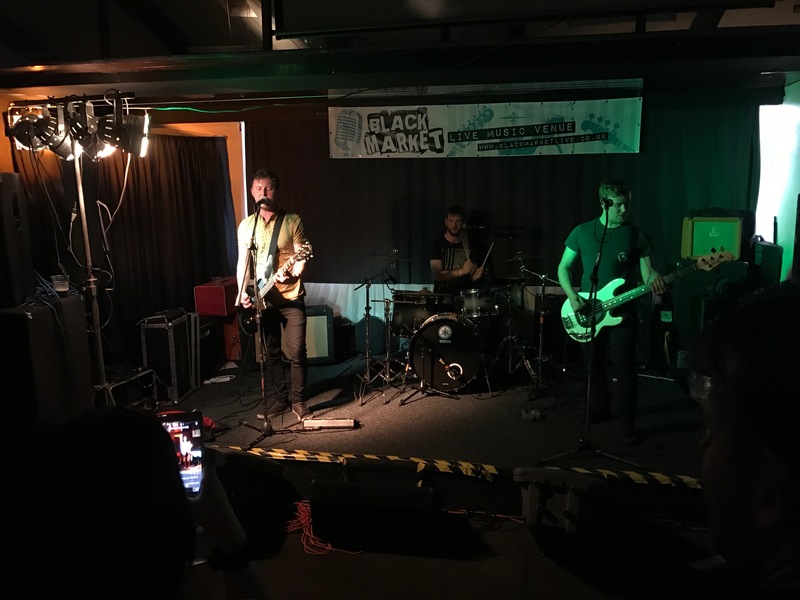 One of those bands I must’ve been at events they’ve played but never managed to see them – I’m glad I have now, and look forward to doing so again. It was a good way to get everyone a bit geared up though – the second stage was ready to let rip with The Outlines who are sounding more and more huge every time I see them. Waiting kicked off the set and then Static. With a new album imminent from them (can. not. wait.) 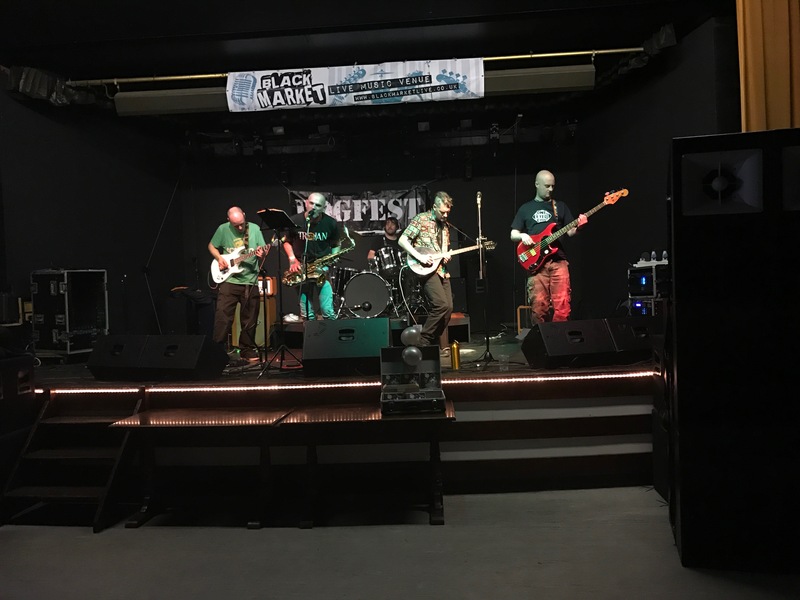 there were a few unfamiliar numbers, but we had Calm Down, Sound of Rain, their cover of The Guns of Brixton and Streets of England, finishing up with a tumultuous finalé of Vanilla Poison. 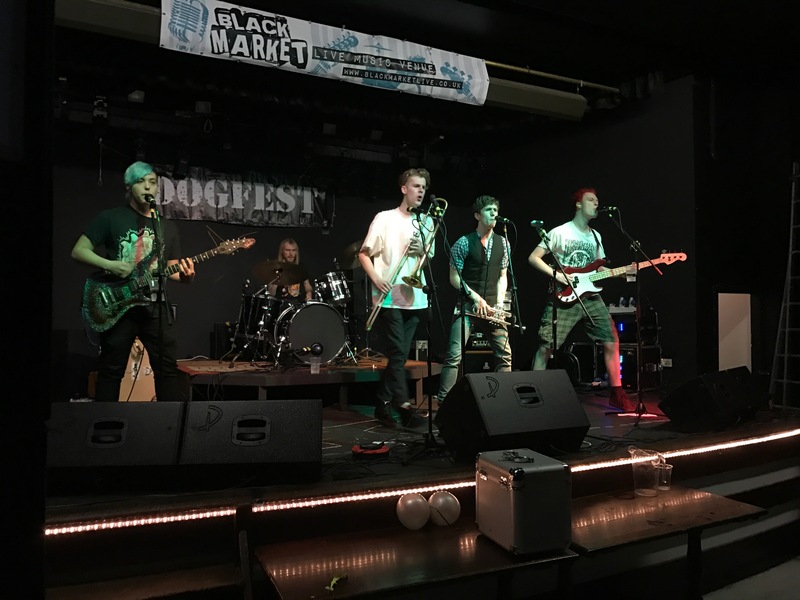 On the main stage Skaciety did a fine job at keeping the energy levels high – ska-infused punk with lashings of brass and bounce, another new band to me – they’ve been confirmed for Bearded Theory I think. I can’t help you with song titles, sadly – but they certainly had the room jumping. 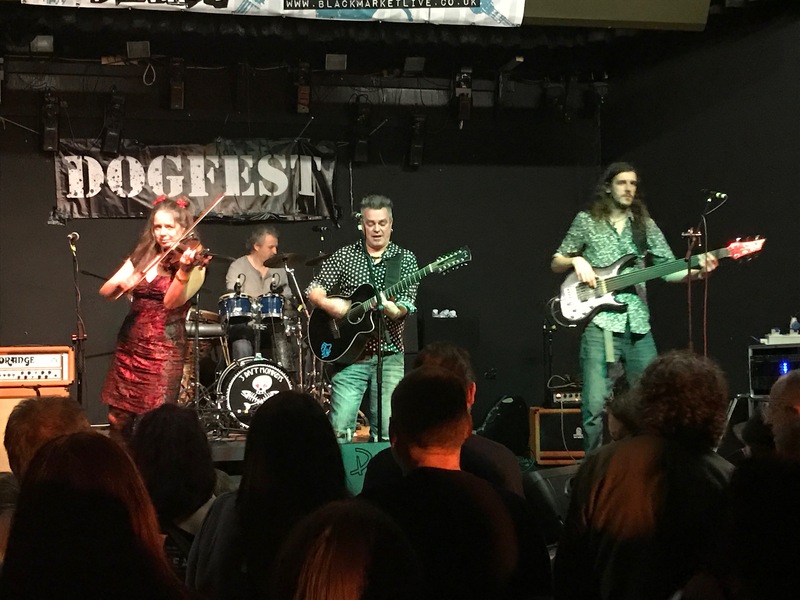 Another one for the list of bands to get to know better… and there should definitely be a LOT more trombones on show at gigs I go to! 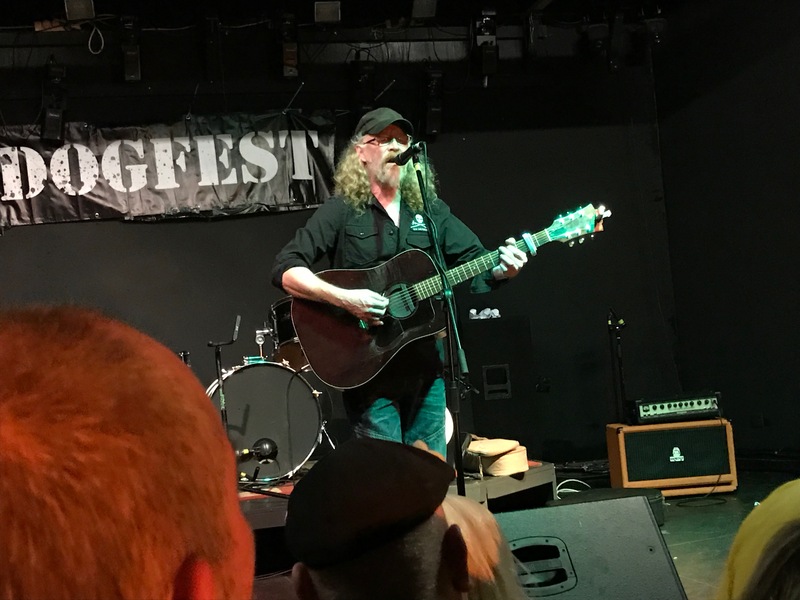 Maelor Hughes was next on the side stage – I was gutted Rev Hammer had been forced to drop out from the line-up, but it’s always a delight to get to see the Lancashire lad put on a set. He was on ripping good form too – Morning Sun, Won’t Fight Your War, Big Golden Pot, Fight With Me and Milltown Boy were my highlights in his set. Unless I wasn’t paying close enough attention (distinctly possible), he didn’t chance his arm at Elation without Chantelle and with Simon Friend already on the premises! 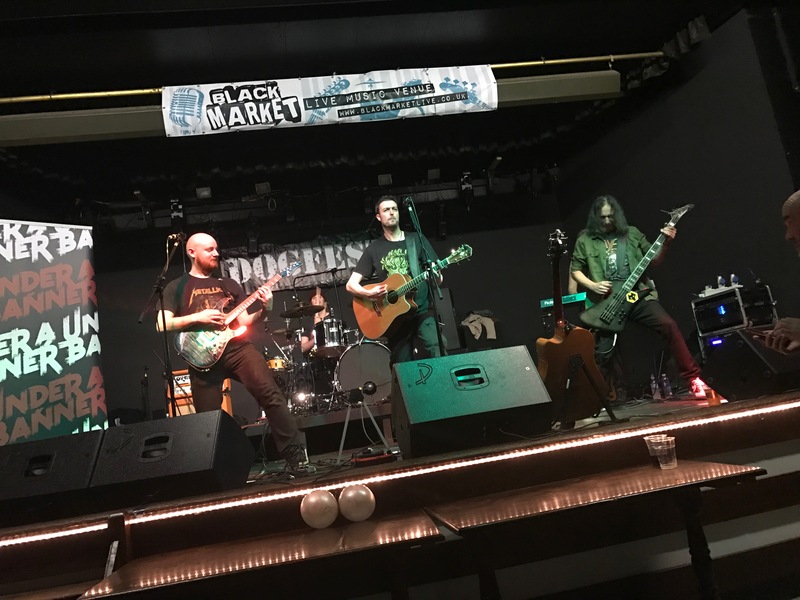 Another band I was excited to see was Under A Banner – I missed a gig of theirs earlier in the year I’d intended to go to having hammered their EP a fair bit. They launched into The Wild Places and took us on a folk punk odyssey which I was more distracted from than I ought to have been. They’ve an album out now too which I really need to get hold of (argh, the ‘music to buy’ list grows ever longer!). 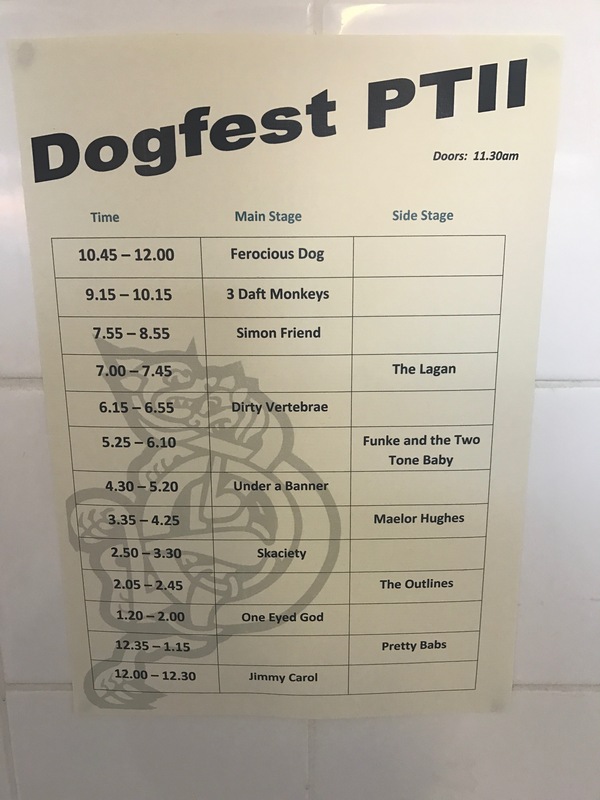 The problem with events like Dogfest (and it’s a nice problem) is there’s so many people to talk to, I fear that did work to the detriment of the band though! Then it was Funke and the Two Tone Baby time! 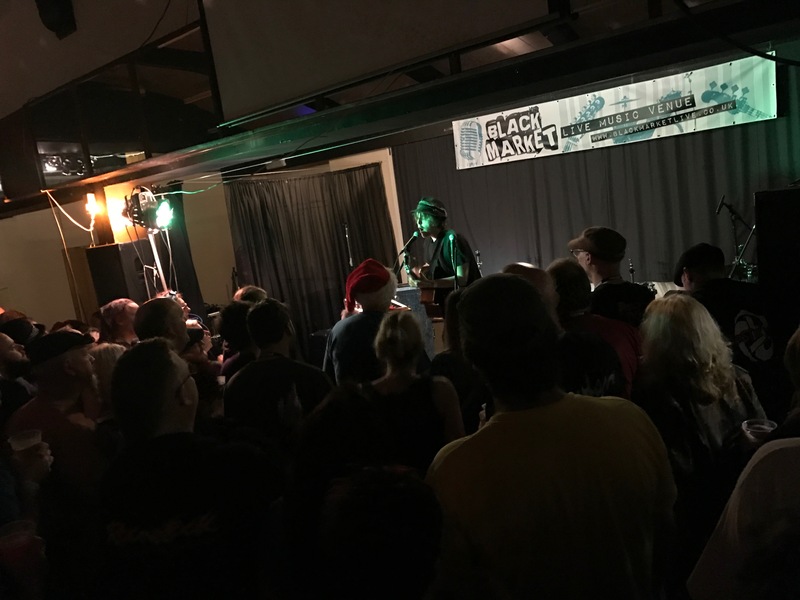 A sizeable crowd had clustered round the side stage so aside from a foray to grab a photo I opted for watching from the bar, Never Used to Dance, Bella’s Kiss, I’m Not Well… were we getting the Live/Not Live set? No! He snuck in the song I’ve yet to learn the name of about working in an office (I’m going to call it ‘The La La La La La La’ song until I learn better! If You’re Nice to Me was a return to familiar territory before another new one – then The Signal Is Cut and finally – of course – Not Enough Bonobo. Awesome set. As ever! 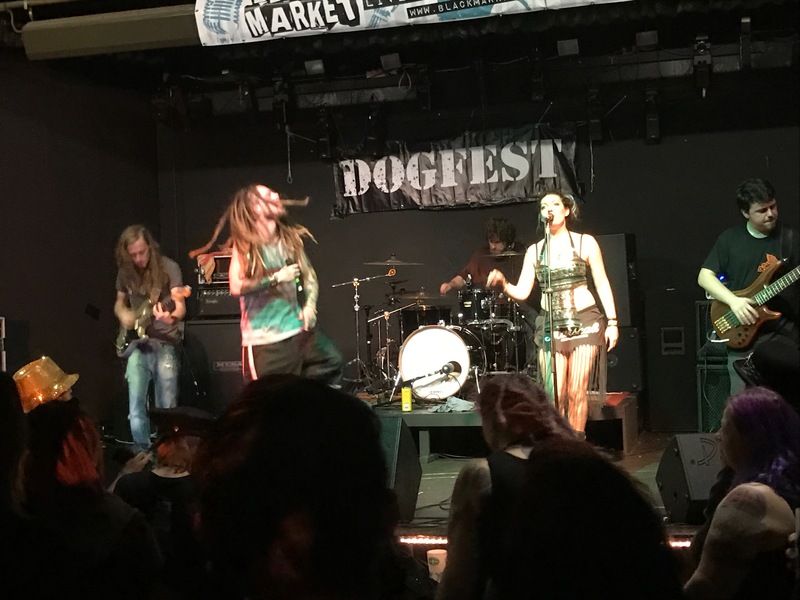 Speaking of reliably awesome sets, Dirty Vertebrae were next – powerful music along with the epic lyrical machinations of Ash and Nicole, you simply can’t not get drawn into their performances. Slick Smile was followed up with a new song to me, and then Melody – a haze of cider and dancing and possibly new songs led through to I Don’t Want To Work Today and a final track of We Do What We Want. They also have a new EP out, which I’m also yet to acquire. Argh! I conspired to miss most of the set by The Lagan, whilst I am kicking myself – there wasn’t an act where I did want to take a break. 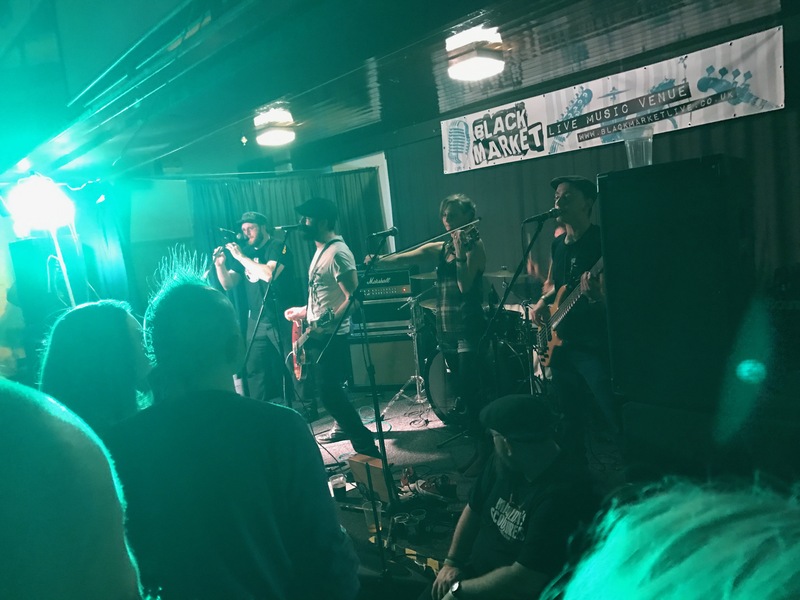 They are amazing high energy folk punk, I’m afraid the only songs I can remember picking up were Tell Me Ma and Same Shite Different Night – I don’t feel so bad as I could have, my normal track is missing new acts to me and missing ones I’ve seen loads before. Sorry guys. You know I love you, though! Now Jim Bob should’ve been up next – who was a new-to-me act I was intrigued by, having been somewhat passed by by Carter USM (sorry, Les!) in their heyday. Unfortunately illness meant he needed to drop out, and Dan pulled out an absolute masterstroke in getting Simon Friend to fill in at short notice. Simon is of course best known for being a sixth of The Levellers, but he’s one of my absolute favourite solo performers and not that frequently out and about to see in this guise. He kicked off a spellbinding set with Believers, which I tried to stream for Ella as it’s one of her favourites and she was stuck at work – only to be confounded by a rare bout of no signal. Sea of Pain, All Your Dreams – Simon’s songs are so beautiful and melancholy, he had the room eating out of his hand in no time. Where The Hell Are We Going to Live led into Cardboard Box City and Social Insecurity – it was like a tour of obscure Levs tracks and b-sides! I was loving it! I think I managed to skip one in my revelry before Dan joined him on stage for Prisoner (written by a certain Mr Nick Burbridge of McDermott’s 2 Hours). (Have a watch of Ferocious Photography’s video if you get a chance). He finished up a frankly amazing set with a singalong of The Boatman. 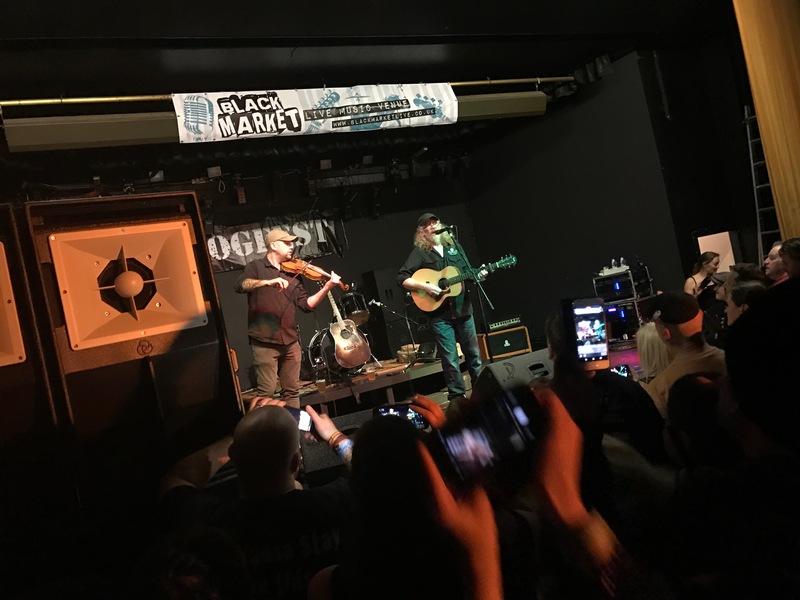 Such a wonderful songwriter, singer and musician – I’ve seen countless folk say they felt priviledged to get to see him in such a relatively intimate setting, and I fully agree. 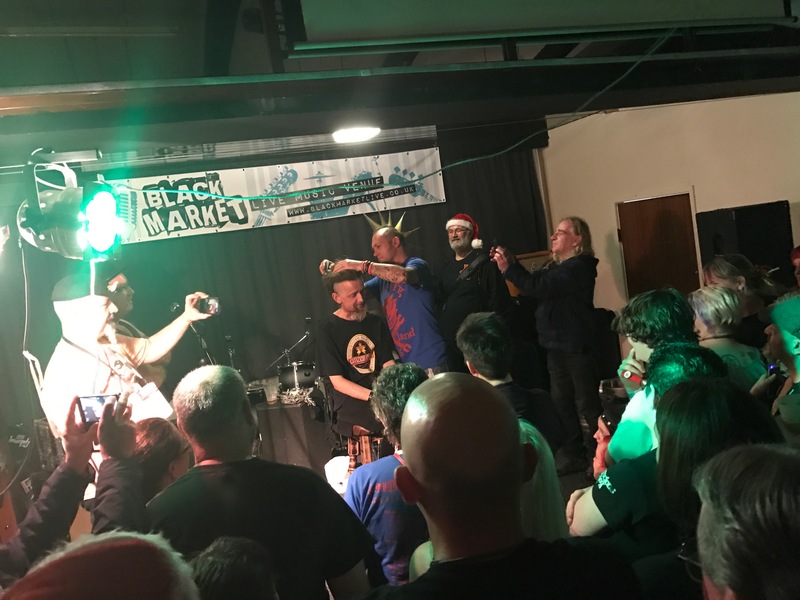 With all the acts on the main stage from now there was time for an interlude on the side stage – Rich had planned to have his luxuriant mane shaved off in order to raise money for Macmillan and The Lee Bonsall Memorial Fund. 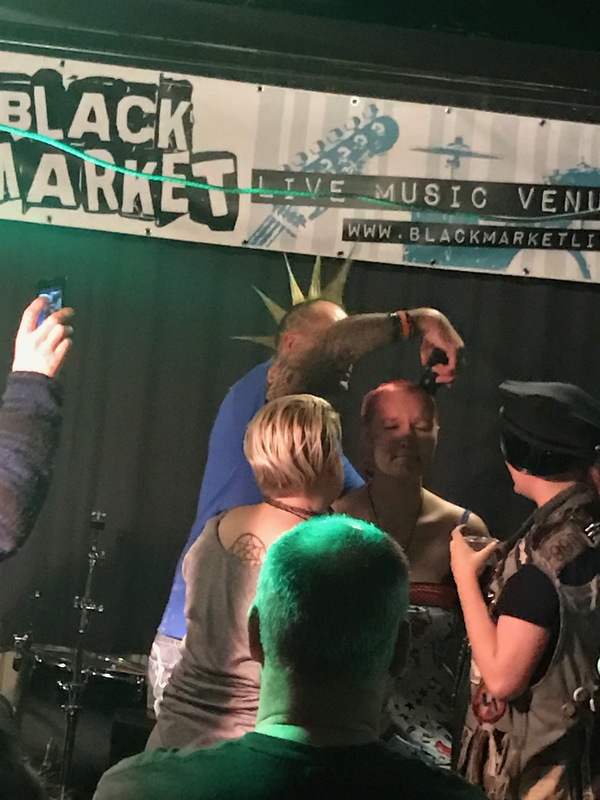 None other than Kenny took the clippers and did it – so far he’s exceeded £4,000 including the cash collected on the night – what a total! If that wasn’t enough, Rhii also stepped up and had her head shorn of her brightly coloured hair too. Awesome stuff! The fundraising page is still active if you fancy chipping in. The home straight for the music was in sight, but it wasn’t letting up on quality. 3 Daft Monkeys are a tour de force as a live act – and they were on great form. One Fine Day kicked things off dedicated to Dan (I remember this happening at his birthday bash a few years back whilst he wasn’t in the room, he was this time, ha!). Not In My Name is a new track, then back to the old with Hubbadillia. We had a run of new songs then – one’s called Drink with God I think, I remember it from Bearded Theory, I didn’t catch the other two. 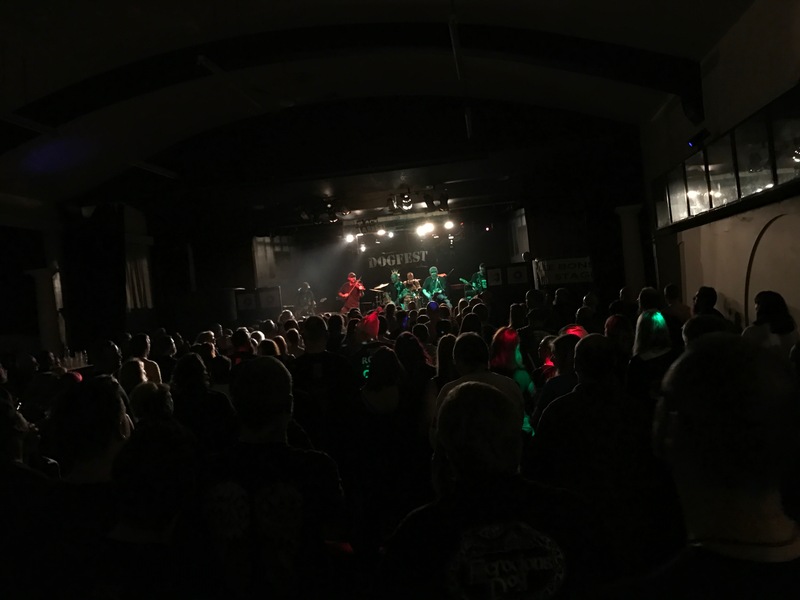 The remainder of the set was wonderfully familiar though, Days of the Dance had the crowd waltzing, Astral Eyes built them into a frenzy and World on its Head kept the room moving (sadly no Brian Stone in attendance to perform some insane contortions! ), Social Vertigo had us all swaying before a magical finalé of The Antiquated and the Arcane (which I did manage to stream for Ella!). You should check out their crowdfunding campaign – it’s wonderfully imaginative. Get on board! Which of course leaves Ferocious Dog! The handy thing about having a van in the car park was the ability to change into shorts and ditch the hoody, glasses and other breakables at short notice. I should also thank Amanda for minding my vape whilst I galavanted. The curtains closed on the the stage, and eventually the intro music boomed out and well, we had Gallows Justice, we had Poor Angry and Young and Lee’s Tune, The Glass and Verse for Lee before my memory gives up. No note-taking in the moshpit after all! 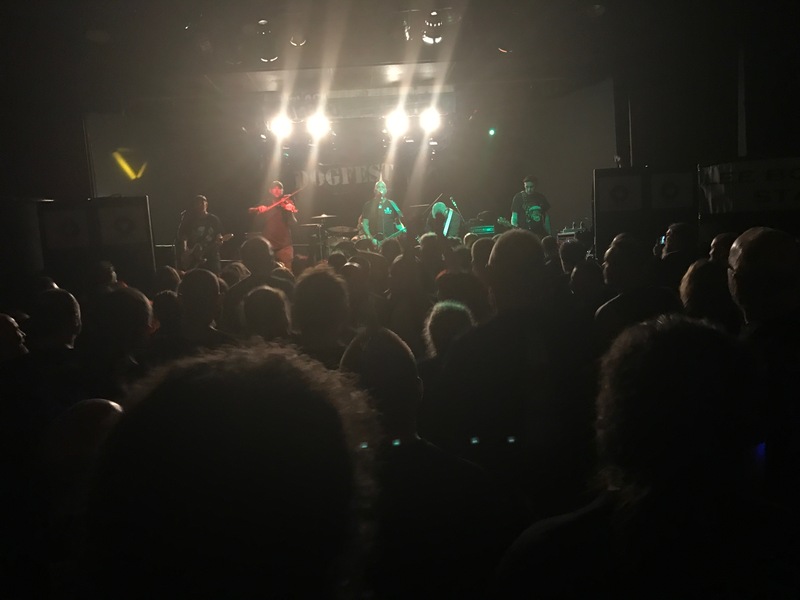 It was really warm – the band were on great form and it was an ideally sized and energy level mosh pit. I only really planned on sticking around for Freeborn John then retiring for a bit – once Too Late was over it kicked in. It had been decided the newly bald Rich should surf so with Dean as board I took the knee-brace position to help keep him upright, he did a cracking job of it, it has to be said. Most impressive! True to my word I went to cool off a bit further back with Mark and Amanda, watching Wez in his brazillian life guard costume causing havoc in the mosh pit from afar was fun (albeit blurry with no specs on), and well, despite being able to take notes again I didn’t, I watched, I danced – it was wonderful. I couldn’t tell you the order, or give you an extensive list but Ruby Bridges, Marikana Massacre, On The Rocks, Quiet Paddy, Freethinker – what’s not to like. Soon enough the lure of returning was a bit much – Mark and I headed back into the fray, for Slow Motion Suicide and immediately had Ella (a different Ella!) on my shoulders at Leanne’s request.. it’s a long song, but she was a lot lighter than Dave is, who was already up. I think Mairi’s Wedding Part II was the final track and that was that for Dogfest, aside from sitting down knackered as people headed out – drinking a Jägerbomb Dean had produced, and marvelling at what had become of Wez’s costume. Haha! An awesome day – great music, great friends and some monumental support for some great charities too. Dan really pulled some amazing bookings out the bag (not least the last minute substitutes! ), the sound was great, the bar service and general hospitality awesome. Dom’s curry was pretty damn special too – having seen him prepping it on Friday night it seemed rude not to try it, I didn’t regret it. Top work! 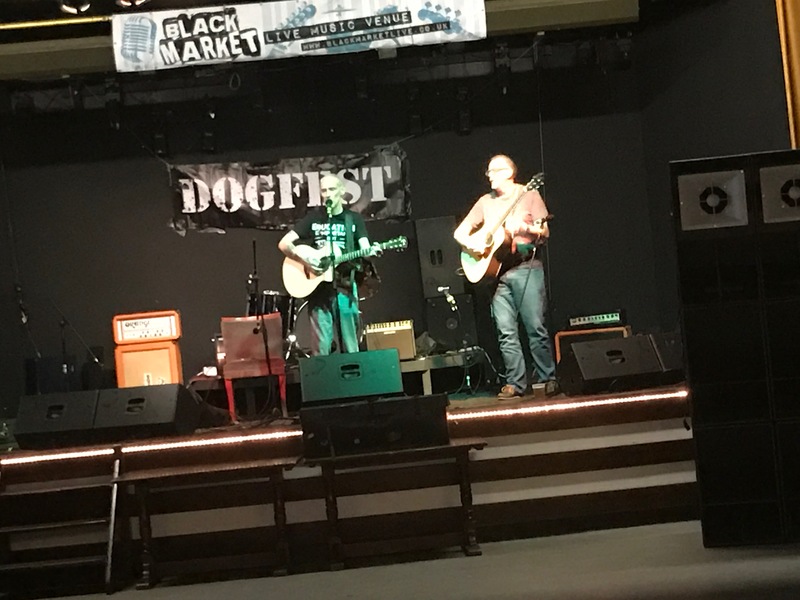 I’m already hearing exciting whispers about some of the bookings for Dogfest 2017 – which will take place on 9th December and some early bird tickets are being released tomorrow.